I have teamed up with Kendra Thorton to bring you some travel ideas that are good for all seasons! First it's my turn. Where do I like to travel? It is within driving distance for my family and we go there at least once a year - usually twice. Breezy Point Resort has a rich history from its days of being built by Captain Billy Fawcett as a playground for his friends in the film industry - Yes, Clark Gable and Carole Lombard went fishing here! It has grown now to have a convention center, three 18 hole golf courses, a marina, an ice arena, pools, beaches and so much to enjoy year round. 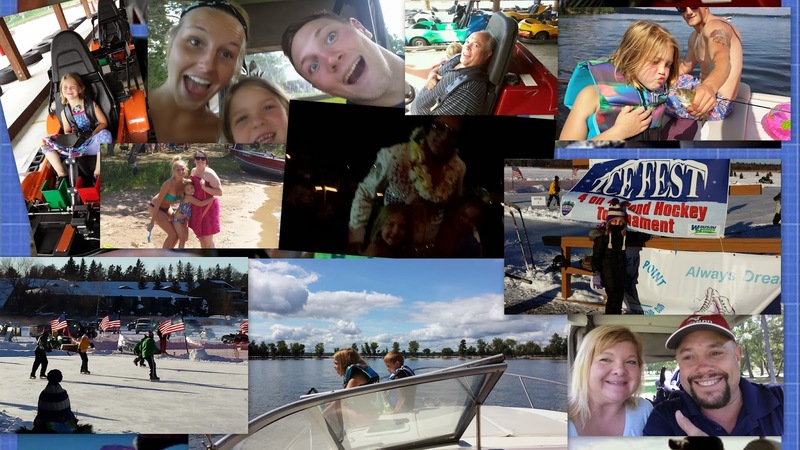 Last summer we took everyone - Fiance and Girlfriend AND Dear Friends - for a few rounds of golf, karaoke at the Commander for Sunday Family Karaoke Night and boating. J-Dogg even sang "Barbie Girl"
This winter we went for ICE FEST and enjoyed snowmobiling across the frozen lakes, snow golf and watching Pond Hockey! Whitefish Golf Course! The very first time we rolled up and heard the classic Sinatra tunes pouring out of the clubhouse we were in LOVE. It is a great course for couples - those who golf a lot and those who just golf a few rounds a year. Pirates Cove Adventure! A great place for all ages to try to get a hole in one! And there are go karts too for the family speed demons! Nisswa! Take the family for a stroll around Nisswa, MN for shopping, ice cream, candy and EATING at Rafferty's Pizza. You can get just about anything in Nisswa. The real attraction of course is the great outdoors. I would highly recommend this as a vacation destination if you really want to relax in the beautiful woods and fall asleep to the call of the loons. And don't forget - all summer long - ELVIS! Now for my travel partner in crime. My name is Kendra Thornton and I'm 40 and a mother of 3. Before being promoted to the full time position of mom, I was the former Orbitz Director of Communications where I was able to travel a great deal. I now live in Chicago with my family, where they are my number one priority in everyday life. I love to travel. There are so many places in the world that are great to visit. One of my favorite places to see is Las Vegas. Here are some great places that I like to visit in Las Vegas. When I come to Las Vegas with my family or friends, I always make it a point to take a tour of the area through Pink Jeep Tours. This experience begins with a pink Jeep arriving at the hotel to pick us up. Next, it takes us to a variety of difference places in the area. Each guide on the tour is friendly and answers every question that we have. There is a day tour that takes people all the way to the Grand Canyon and back. I really like flying into the airport in Las Vegas, since I can get a great look at the view of the city. Maverick Helicopters Las Vegas enables me to take a tour of the city from the air. My pilot was friendly and quite knowledgeable. It felt so neat to put on a headset and rise above the city. It was an experience I will never forget, and my children bring up this adventure every time they see a helicopter. In Las Vegas, there is not a shortage of fantastic places to eat. Although prices may be a bit steep, it is worth the cost for families and couples. When I am in the city with my husband, we love to go to the Fiamma Trattoria & Bar at the MGM for unforgettable Italian food. The pasta is memorable, and the prices are reasonable. Steak enthusiasts will enjoy the SW Steakhouse, which is at the Wynn. There is a great water show that entertains diners. I love going to the beach, and Mandalay Bay has brought it to Las Vegas. I can grab a beverage, get on an inner tube and float on the water. It is great to soak up the warm sun. There is a wave pool and a lazy river. These options give me the opportunity I need to relax. Las Vegas is a great place for me to be and the city offers a number of hotel options. Sites like Gogobot make it easy to read user reviews so you can be sure about your purchase. There are so many things to see and do. That is why I keep going back each year. Looks like some fun options. My kids research the mini-golf options with every place we visit--it is a given.